Amazing Threads is located in Maple Grove, the Mecca of shopping and restaurants along with lakes and parks galore. We are glad to be part of this ever growing and beautiful suburb. We take our Color Inspiration from the many lakes and gardens located in Maple Grove. Amazing Threads was launched in 2002 and was the first new yarn shop to open in the Twin Cities since the 1980’s. We have grown considerably during the past 12 years. We say we have “the perfect shop” full of yarn, needles, books, notions, patterns, bags and more. We are a hand dyers heaven. In 2000, Amazing Threads was designated as a “SHOP WITHIN A SHOP” for Rowan, SMC Select, & Schachenmayr Yarns. We are one of 5 such stores in the US the only one in the Twin Cities. We love these yarns and our wall of fibers tells their own stories each season. Yarn, knitting, crochet, friendships, shared passions…”So much yarn, so little time” we often lament. We only do yarn and fiber while specializing in yarn and color coordination for any project. In addition to a shop filled with fibers and a classroom for our community of knitters, crocheters and social fiber groups, we provide LOTS OF INSPIRATION for every knitter or crocheter, regardless of your skill level. The staff love to create of samples and it shows. Our goal is a sample in every yarn with carry. We love when our customers drop in with show and tell projects as well. It’s amazing when we see yarns come alive in a variety of accessories or garments. 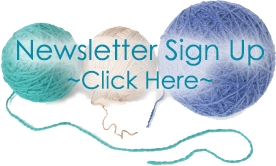 “What’s New” each week and catch one of my weekly blasts that include free patterns and knitting resources. Share the passion for your craft.